MOSCOW (Sputnik) - An explosion at a pesticide plant in the Jiangsu province in eastern China has killed at least 62 people, Chinese Central Television reported on Friday, adding that 26 of which have been identified. At least 34 people are currently in critical condition and 60 people have severe injuries, the broadcaster said. 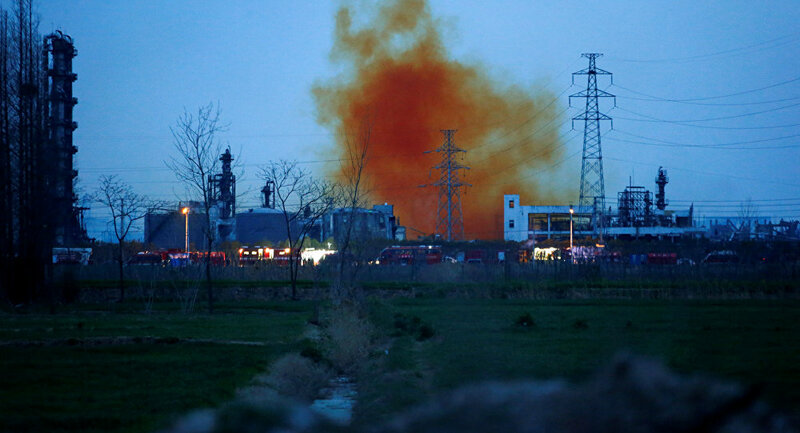 A powerful blast in Yancheng's Tianjiayi chemical plant occurred at around 2:48 p.m. local time (6:48 GMT) on Thursday. At least 640 people have been taken to hospitals after the explosion with over 3,000 medics now working to provide support to those affected, according to local authorities. ​A cause of the blast has not been identified yet and it is not yet clear what chemicals exploded and what substances got into the atmosphere. Experts are conducting environmental assessment at the scene of the incident. Earlier on Friday, the local administration reported that the drinking water in the vicinity of the explosion had not been affected. ​This was not the first time China had suffered a severe plant explosion. In November, at least 22 people died and 22 more were injured following an explosion near a chemical plant in the northern city of Zhangjiakou In 2015, 165 people were killed in a series of explosions at a chemical warehouse in the northern city of Tianjin.